I can't wait no more!! 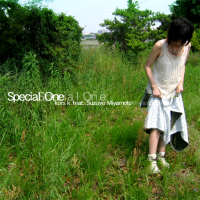 A piano ballad arrangement of Special One, titled Special One(Dreamin' Of You), appears on kors k's first album, Ways For Liberation. Special One is one of the Class C unlocks in jubeat. In jubeat ripples and its APPEND version, it is one of the White C Class unlocks. In jubeat prop, it was part of the Step unlocking system, unlockable by reaching Step Level 13. Special One marks kors k's first appearance in the jubeat series. Special One is one of four jubeat crossovers for beatmania IIDX 17 SIRIUS as part of the jubeat×beatmania IIDX APPEND STYLE event. Special One is made playable by playing jubeat ripples on March 8th, 2010 onwards and having a save file on the player's e-AMUSEMENT PASS. In UBeat location tests, Special One's artist was just credited to kors k.
In jubeat plus and jukebeat, Special One uses this jacket as well. Special One is used as background music in a mission on the KONAMI arcade game ROAD FIGHTERS (ロードファイターズ). Special One is one of the three songs available by default in the Android release of jubeat plus, along with Jumping Boogie and 天国と地獄. Special One was removed from jubeat saucer when the game was released. However, it was later revived on December 31th, 2012. It was removed again on April 1st, 2013. It was revived again on February 1st, 2014. Special One received a BEGINNER chart in beatmania IIDX 19 Lincle. This chart was removed in beatmania IIDX 26 Rootage. Special One can be unlocked from April 12th, 2016 on beatmania IIDX INFINITAS' Akashic Explore event. Special One is the CHALLENGE15 unlock of DanceEvolution ARCADE's CHALLENGE category (CHALLENGEカテゴリー) unlocking system. Special One is unlockable in DanceDanceRevolution A from August 8th, 2016, as part of the BABY-LON'S ADVENTURE (バビロン アドベンチャー) event. It is unlocked by clearing WORLD 3. Special One is one of the 2 Players/みんなでBATTLE exclusive songs in DANCERUSH STARDOM. It was available for play from August 17th to 19th, 2018. It was available again from August 24th to 26th, 2018. It was available again from August 31st to September 2nd, 2018. It was available again from September 7th to 9th, 2018. It is permanently available from September 14th, 2018 (though it is still limited to 2 Players/みんなでBATTLE). From October 9th, 2018, it is available for all modes. This page was last edited on 9 April 2019, at 16:32.